What is the PROB Function? The PROB Function is categorized under Statistical functionsFunctionsList of the most important Excel functions for financial analysts. This cheat sheet covers 100s of functions that are critical to know as an Excel analyst. It will calculate the probability that is associated with a given range. In financial analysisFinancial Analyst Job DescriptionSee a real Financial Analyst Job Description including all the skills, experience, and education required to be the successful candidate for the job. Perform financial forecasting, reporting, and operational metrics tracking, analyze financial data, create financial models, the PROB function can be useful in estimating business losses. It can also be used by a risk manager to carry out financial probability analysis. X_range (required argument) – It is the range of numeric values of x with which there are associated probabilities. Prob_range (required argument) – It is the set (array) of probabilities that is associated with values in x_range. The array must be of the same length as the x_range array and the values in prob_range must add up to 1. Lower_limit (optional argument) – It is the lower boundary of the value for which we want a probability. Upper_limit (optional argument) – It is upper boundary of the value for which you want a probability. When we omit this argument, the PROB function ill simply return the probability associated with the value of the supplied lower_limit. 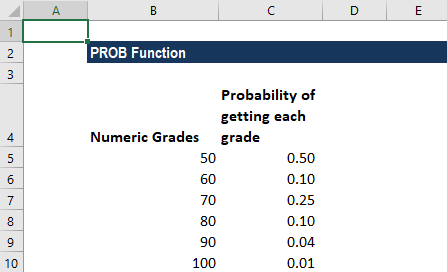 How to use the PROB Function in Excel? Let’s assume we are given two dice and we wish to find the probability of getting a roll of 10 or higher. 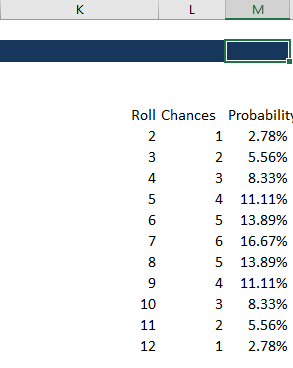 When we roll dice 1 and dice 2, the chance of getting 2 is possible only when we get 1 on both dice, so chance = 1. We listed the numbers 1 to 6 and then in cell D6, we added the value of C6 and D5. Similarly, for D7 it is the sum of C7 and D6. The COUNTIF function is used wherein the array is given as the range and the criteria argument is the roll. 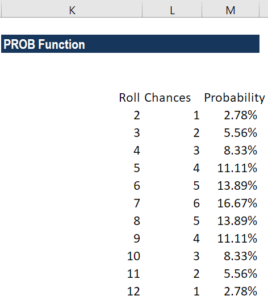 For probability, we divided the chances by 36, as there are 6 x 6 = 36 possible rolls. We can cross-check the figures by adding the individual probability calculated: (8.33%+5.56%+2.78%) = 16.67%. The values in the given prob_range do not add up to 1. N/A! error – Occurs if the given x_range and prob_range arrays are of different lengths (i.e. contain different numbers of data points). If we omit the upper_limit, PROB returns the probability of being equal to the lower_limit. 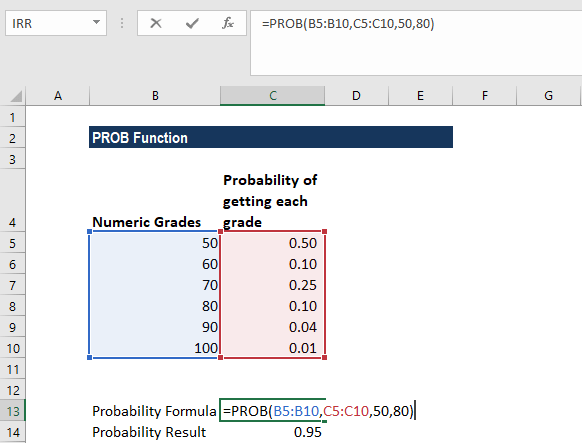 The PROB function was introduced in MS Excel 2007 and hence is unavailable in earlier versions.